This handmade bath bomb will create an interesting bath experience as you drop it in the tub and watch it slowly melt away while releasing a plume of grayish black fizz. It will enhance your bath time with its lovely scent and wonderful skin-loving ingredients. Not only will it make a unique and indulging gift for yourself or a loved one, it would add pizzazz to any of your events because you can use it as a party favor for your bridal shower, baby shower, or even your bachelorette party. You will get a discount when you order 10 or more. Convo me for more info. This listing is for one bath bomb. Bath bomb weighs approximately 5 ounces. 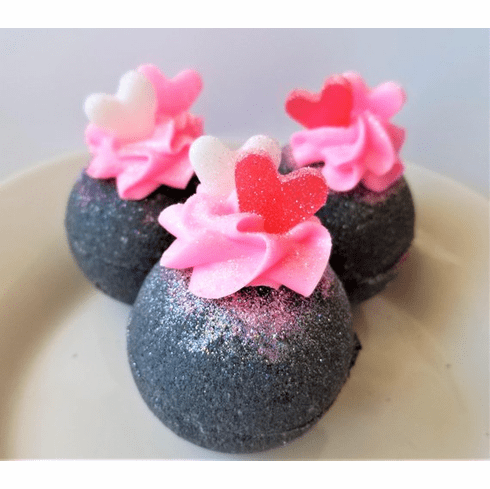 It is colored graphite black and is topped with pink frosting, white, pink, or red mini heart soaps, a dusted with pink glitter. Contains activated charcoal, almond oil, avocado oil, sunflower oil, and jojoba oil. Scented in a fragrance that has notes of vanilla, mango, maraschino cherry, and orange.